Personal Lea: Happy New Year! I know, I know - its time to take down the Christmas posts! I just love that little gator with the Santa hat so much I couldn't bear the thought of replacing him! No, really, I've just been to busy to blog! So . . . a new year is upon us and we here at Preppy In Paradise have been shopping for new and exciting things for you guys! 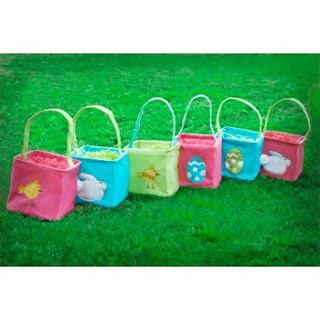 You should stop by and see the new tennis bags that just arrived as well as the Easter baskets! To say they are cute would be an understatement - but we don't just buy things because they are cute - we always look for things that are useful, high quality and stylish. If you like the Halloween totes you must see the Easter ones - they are gorgeous! In other news - Scout is releasing over 300 new products this month - that means new patterns for all of you Scout bag lovers! They told me last week that the new catalogue would be available mid-month and as soon as it is you can be sure we will put it on the blog! We have restocked the Piggy Paint also - a girl has to be able to have her nails pretty for Valentine's Day - even if it is at the preschool! You may have heard the rumor that we are looking for additional retail space - its true, but nothing solid yet - so stay posted! We want to find the most convenient and comfortable place for our clients. Drop us a note if you have any questions, watch for an upcoming contest and let's all have a wonderful 2010!